Are you resisting braces because you are afraid of showing metal? No problem! Invisalign invisible braces a removable and custom designed is here to help! Dr. Ashouri is an Invisalign Elite Top 1% provider which means that she is among the top 1% of most experienced Invisalign providers in North America. If you are interested in learning more about Invisalign invisible braces, please contact Dr. Ashouri at (650) 961-5047 and schedule your complimentary consultation. 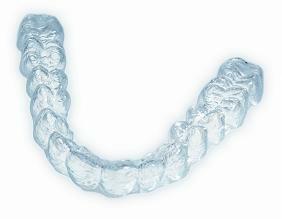 Invisalign uses a set of custom-built clear trays (aligners) that are removable and comfortable to wear. You can remove them while eating and brushing your teeth. This totally eliminates any type of food restriction. Compared to the restrictions on sugars, carbohydrates and sticky foods for metal braces, this freedom is a major step forward in orthodontics. You will hardly notice these invisible braces yourself when you look in the mirror. Not only Invisalign (invisaline) is quite comfortable, it is also very undetectable, and today, we can correct many dental conditions such as overbite and underbite with Invisalign here in our Mountain view orthodontic office. You will need to visit your orthodontist every ten weeks for a check up and adjustments. She will change your clear braces at regular intervals. Every set of invisible braces you use will be custom designed for you and will be made to the exact specifications as determined by the orthodontist. The duration of the treatment will depend on the degree of correction required and will last for about one to two years. An Invisalign specialist will use the latest 3-D computer technology to take an image of your teeth. From detailed studies of your jaw structure, she will then determine the amount of correction required. Using these images she will provide you with sets of invisible braces that are to be worn for about one week each. These clear braces will slowly shift your teeth into their corrected position. The 3-D computer technology allows you to see your treatment before you begin so you have very good idea of how your teeth will look when the treatment is finished. Invisible braces are both psychologically and physically comfortable, since there is no metal in your mouth. People are seldom aware that you are using Invisalign. And you do not have to spend time with the dentist getting your braces adjusted, as would be the case with metal braces. Your clear braces are made of medical grade clear plastic. This is nearly invisible and fits your teeth like a glove. Invisalign received FDA approval in 1998 and has been used to improve the smiles and lives of more than a quarter million people since then. While the basic technology has been known since the 1940s, advanced computing and precision manufacture of clear braces has made it possible to mass produce customized invisible braces for the masses! You can also visit the Invisalign website directly to learn more about the Invisalign process! The iTero Scanner is the latest technology for digitally capturing an image of your teeth. It is far more accurate than any impression that we could take in the office with the old method of a mouth full of messy impression material. This technology allows you to visually see the result on the computer as your teeth are scanned. The scanner head fits in the mouth easily, basically taking digital photos of the teeth and sending them directly to the computer. The iTero digital data can be sent directly to Invisalign to get Invisalign treatment started sooner. We are very excited to be using this amazing technology. If you have any other questions, or would like to schedule your appointment, please give us a call.